The past few years have witnessed intense research in this fascinating field as well as many controversial discussions. Now the time is ripe for a comprehensive book covering not only theoretical aspects, but also such mechanistic topics as principles and mechanisms of photoinduced charge injection, transport and trapping in DNA, sequence-dependent DNA dynamics, spectroscopic investigations of hole transport and much more. Edited by Hans-Achim Wagenknecht, and written by renowned international authors, this book provides an excellent overview with high quality contributions, making it a "must-have" for everyone working in the field. "In this very attractively produced book, it is evident that much attention has been devoted to clear and consistent presentation of the material." "The book addresses all modern work on charge transport in a timely fashion. 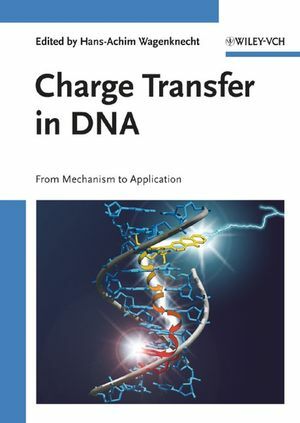 I could not agree more with Professor Grey after reading this scholarly book: "All theorists and experimentalists interested in charge transport will want to have Charge Transfer in DNA in their personal libraries." " ... a very timely book ... In general, the book is very recommendable to Diploma and PhD students entering this area of research , since it provides a good overview about the approaches, theories and aims in this field, including in each chapter, and this is really remarkably, recent literature up to 2004. It also has the merit to provide the reader with important spectroscopic and redox data for different donors, acceptors and bases ... The keyword index is very useful and allows not only to find topics of interest but also redox potentials of common donors and acceptors."